Kahok Nation show your Kahok Pride! CMS 8th graders get ready to turn your wardrobe purple! CHS students add to your school spirit wardrobe! 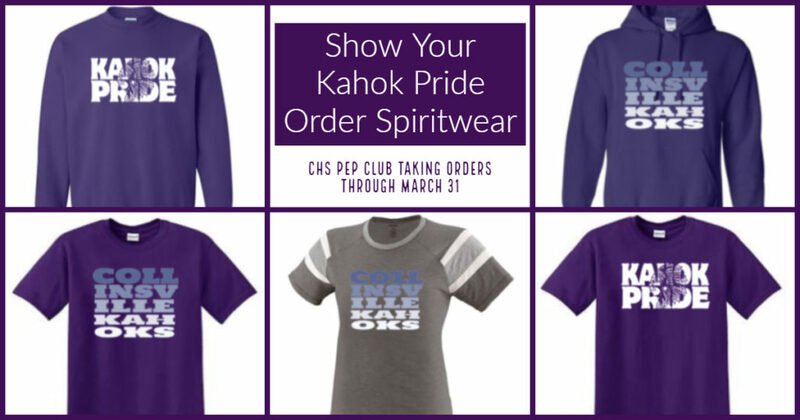 The Collinsville High School Pep Club is taking orders for Spring 2019 Kahok Pride Spiritwear from now until midnight on Sunday, March 31. The collection includes two unique designs displayed on athletic gear in adult and children’s sizes. Check out special styles for ladies. Please Note: Orders will be delivered before Spring Break to CUSD 10 schools. When you place an order, please indicate a school for delivery. Members of the public must choose a school for delivery and pick up items from that location. Place your order today using this link.